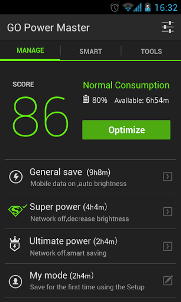 The choice of more than 15 million users, GO Battery Saver & Widget is a very Powerful and smart tool to reduce, substantially, battery loss and even prolong battery life by more than 50%. This app is developed to manage the battery of your Android device so that you may use the battery as per your own needs. It helps to decrease the power loss and prolongs the battery life of your Android mobile device. With pre-set modes and toggle control, GO Battery Saver & Widget can enable your mobile device to configure the battery saving schedule to the unique needs of your mobile. After due configuration, it runs automatically and intelligently, switching modes, turning on/off toggles as with different battery level, phone status or time.